Chosen as best in the industry! | TFI Envision, Inc. Chosen as best in the industry! Home / Archive / The News / Chosen as best in the industry! for their design work for Honeywell Consumer Products Group! One of the awards was for the series of impactful, brand reinforcing sales promotion sheets for Bendix® Brakes. 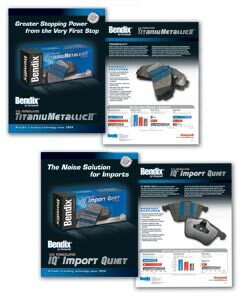 The format allows each product to be recognized while the group of sell sheets together clearly promote and support the Bendix brand. Another award was for the multifaceted Prestone® Antifreeze/ Coolant $5 Gift Card Rebate program which included eye-catching shelf talkers (that seem to reach out and hand you the gift card), tear off pads and consumer gift cards. Both programs earned honorable mention awards for their creative execution and drawing power. Awards will be presented to the Honeywell CPG marketers and TFI Envision, Inc. during the 14th Annual Automotive Aftermarket Global Design Awards segment of the AAPEX Show in Las Vegas, on Nov 4, 2008.